The earliest GIA course materials in the Richard T. Liddicoat Gemological Library and Information Center that mention the 4Cs are from 1949. Diamond color, clarity, cut and carat weight are collectively termed the “4Cs” – the factors that, when combined, define a diamond’s quality and ultimately determine its value. Prior to 1940, however, there were no standard terms or factors that defined diamond quality. Going back as far as the 1500s, merchants used many different and inconsistent terms to talk about the four elements of a diamond’s value. “Without flaws” or “with imperfections” were used to describe clarity; “tincture” or “tint” to describe color; and terms such as “make well” or “made poorly” to describe cut. “Carat” to describe weight is the only term that was consistently used from the 1500s to today. Because of these different and inconsistent terms, there was no easy way for jewelers to communicate those elements of value to their customers or for their customers to remember them. In the early 20th century, Robert M. Shipley, a former retail jeweler, undertook the task of professionalizing the American jewelry industry. To that end, he established GIA in 1931 to provide formal gemological training to aspiring jewelers. Shipley also established the American Gem Society (AGS), a professional guild whose members were GIA graduates. Shipley standardized the diamond value terms to color, clarity, cut and carat weight and called them the 4Cs, a mnemonic device to help students and jewelers learn about, remember and explain the factors that determine a diamond’s value. Under Shipley’s direction, the term 4Cs became part of industry vernacular through GIA course materials and advertising GIA prepared for AGS-member retailers. 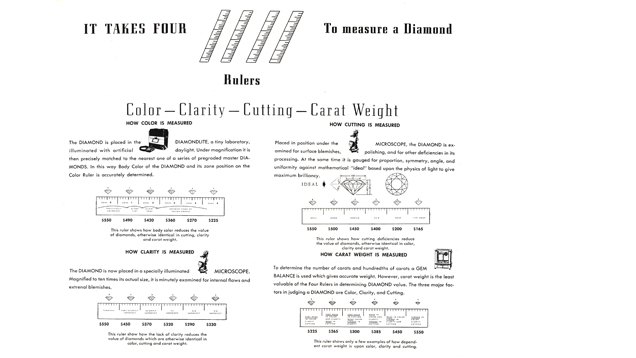 A GIA student helped produce the first chart used in GIA’s course materials about the 4Cs, “explaining how diamonds can be compared in value by measuring them with these four rulers.” The term also appeared in the AGS booklet “Diamonds” in 1951, and continues to be part of GIA and AGS materials. Beginning in 1940, GIA collaborated with De Beers to create advertising designed to stimulate an interest in diamonds. Jewelers began to use the term 4Cs in news articles as early as 1941. N. W. Ayer & Son wrote “Secrets of the Diamond Expert” for The Jewelers’ Circular-Keystone (now JCK magazine) in 1954. It focused on the 4Cs and the material presented seems to have evolved from the talks given in 1947. It was meant as a “speech for jewelers to use to address consumer groups,” according to a secondary headline in the article. While De Beers helped with the advertising campaigns that involved the 4Cs, it was not until August of 1962, when the term had become popular, that De Beers adopted the term 4Cs in its national magazine advertising campaign. It stopped using the term purity and started using Shipley’s term clarity (a word starting with ‘c’). Today, the 4Cs of Diamond Quality is the universal phrase for referring to the four qualities that determine the value of any diamond, anywhere in the world. This simple mnemonic device, along with the grading standards and practices GIA also developed, means that diamond quality can be communicated in a universal language so diamond purchasers know exactly what they are buying. perfect engagement ring for the love of your life.